The Full Moon showed up in the Neptunian haze. Pisces is a dual sign. The glyph of this water sign depicts two fish tied together swimming in opposite directions. The Full Moon conjoined Neptune and Chiron, thus soaking up their energies, which strengthened the inherent feeling of sensitivity and vulnerability of the Pisces Moon. 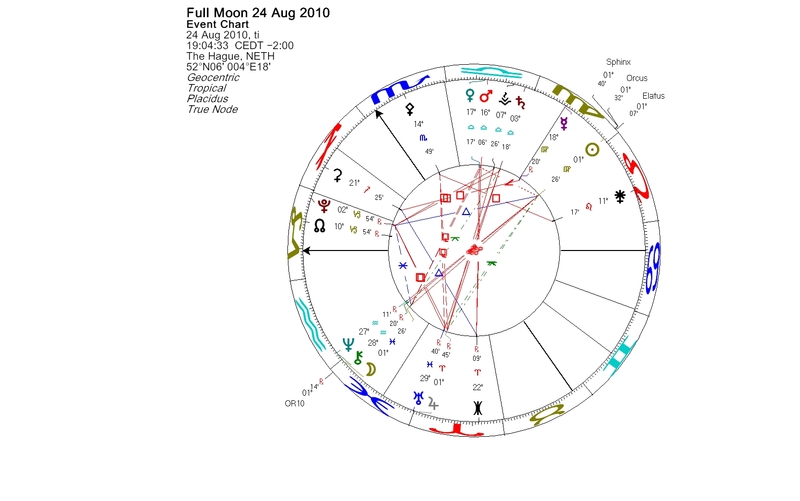 Orcus, a minor planet in Pluto’s class, was opposite the Moon and emphasized the theme of duality in the chart. The Moon at 1+ degrees of Pisces occupies the same degree with one of the largest dwarf planet candidates, 2007 OR10. This Kuiper belt object has been nicknamed Snow White. This object has not been officially named, as the discoverers want to learn more about the planet before proposing a real name for it. Also the astrologers need to study the planet carefully before they can establish the astrological meaning of it. More about this relatively new discovery in my blog post from November 2009. A Full Moon takes places once a month when the Sun and the Moon are opposing one another. The Virgo Sun shared its degree with asteroid Sphinx, centaur Elatus and trans-Neptunian Orcus. The Sun is still in close conjunction with these three bodies. In Virgo we are analyzing information, concentrating on details, and striving for perfection. Asteroid Sphinx represents a great mystery. In the chart it can refer to missing information or lack of understanding. Sphinx in Virgo may feel nerve-racking. A little bit of Piscean compassion will help. Chiron and Elatus are both Centaur planets traveling in space between Saturn (limitations) and Uranus (freedom) and symbolically bridging the conflicting meaning of these giants. Saturn and Uranus have recently made their last opposition in the current series of five. Chiron and Elatus will continue their long ongoing opposition till 2015. Astrologer Len Wallick elaborates further on the opposition of Elatus and Chiron on the Full Moon axis on Planet Waves Daily Astrology blog. The Kuiper belt object Orcus shares some fascinating similarities with Pluto. Their orbits are nearly identical. Both are locked in 3:2 resonance with Neptune, making two revolutions around the Sun, while Neptune makes three. Both have perihelia above the ecliptic, but their orbits point in nearly opposite directions. Pluto and Orcus will always stay in opposite phases of their orbits because they are forced by Neptune to have precisely the same orbital period. Mike Brown, whose team discovered Orcus in 2004, calls Orcus the anti-Pluto. It is named after a god of the dead in Etruscan and Roman mythology. Orcus was a punisher of broken oaths and portrayed as a hairy, bearded giant. Like the name Hades, or the Norse Hel, Orcus could also mean the land of the dead. Orcus is actually a binary system. The big and bright companion is named Vanth after a daimon in Etruscan mythology who guided the dead to the underworld. She was depicted with wings and a torch, and frequently shown in the presence of Charun, a guard of the underworld. A true binary planet is a pair of worlds that usually are similar in mass. Each orbits the other around a gravitational balance point in space between the two. This center of mass, also called the barycentre, is not located within the interior of either object. Orcus and Vanth are probably tidally locked, which means that they have their same faces locked towards each other constantly, just like Pluto and Charon. Orcus and Vanth form an unusual system in the Kuiper belt. It seems to be some kind of intermediate, which offers always two possibilities or choices. The origin of the companion is uncertain. Two scenarios appear equally plausible for explaining the formation of this binary: a giant impact or by capture. While most large Kuiper belt objects like Orcus have small satellites, and smaller objects and their satellites tend to be much closer in size, Orcus sits in the middle. Orcus is one of the larges objects in the Kuiper belt with a relatively large companion. Astrologically Orcus can be associated either with the underworld or with orca whales, sometimes called killer whales. Killer whales despite their name are not a threat to humans, and actually they are not really whales but dolphins. Mercury, the ruler of Virgo, is currently retrograding in its own sign. This can add confusion and misunderstandings. Be extra careful if you are making important decisions now. Check the facts and the missing bits. The New Moon starts the monthly lunation cycle. At the time of the exact conjunction of the Sun and the Moon, the Moon is invisible from the Earth. The conjunction occurs in the middle of the Dark Moon period, which lasts about 3 days. The dark phase of the lunar cycle is personified by various dark goddesses, which symbolize the feminine shadow. Two of these goddesses, Nyx, the queen of night, and Nemesis, one of her daughters, were present at the Leo New Moon: asteroids 3908 Nyx and128 Nemesis were in conjunction with the luminaries. They are still in focus, closely conjunct the Sun. Asteroid 128 Nemesis is a very large and dark main belt asteroid, discovered in 1872. Asteroid 3908 Nyx was discovered in 1980. It is 1-2 km in diameter and it may be a fragment of the asteroid Vesta. In all astrological cycles, there is the last, dark phase preceding the beginning of a new cycle, new growth. The dark period is for healing and renewal, and we all have many of these periods during our lifetime. These are times when we may experience a loss, an ending of a relationship, or some other kind of change in our personal lives. We tend to fear the unknown, but still we have to let go of the old in order to start something new. A threefold lunar cycle consists of three phases: the waxing New Moon, the Full Moon and the waning Dark Moon. These phases symbolize the three stages of womanhood: maiden, mother and crone (the wise woman). The dark phase before the New Moon represents the crone. The Dark Moon also represents the Jungian shadow, the rejected part of the psyche. We all have a shadow, which we tend to project into other people, and the more these projections are unrecognized, the blacker and denser the shadow grows. The shadow is the messenger of our unconscious mind. The underworld of the ancients is a metaphor for the unconscious. The dark goddesses were all queens of the underworld. If we acknowledge our inner dark goddesses and are able to develop a compassionate relationship with our shadow, the healing and renewal can occur. Nyx, Mother Night, was a figure of exceptional power and beauty. She was one of the Greek primordial gods. This group of gods represents various elements of nature, and they were born of Chaos. Nyx took on an even more important role in several poems attributed to Orpheus. In them, Nyx, rather than Chaos, was the first principle. Nyx was was the black-winged goddess of the night. According to the myth, she laid a silver egg out of which the world is born, in the lap of the infinite deeps of darkness. In her triple aspect, Nyx displayed herself as Night, Order and Justice. The Fates, the Furies, the Hesperides, Nemesis, and sometimes Hekate were said to be her daughters. The task of the daughters was to ensure that the natural laws of the universe were carried out and maintained. Nemesis, the daugher of Nyx, was the goddess of retribution. She was depicted with a wheel of fortune in one hand and an apple bough in the other. Nemesis symbolizes our conscience and guides us towards right action. When we pay honor to this goddess, then she resides within us as a wise, kindly influence. If we don’t pay attention to her, then we have to deal with the consequences. Quoting Demetra George: “Nyx, Goddess of Night, teaches us that we are, at our most fundamental level, all part of the same whole. Her daughter Nemesis then guides us toward respecting others as extensions of ourselves through right action with the natural laws of an orderly universe.�? You are currently browsing the Lunations by Kirsti Melto weblog archives for August, 2010.